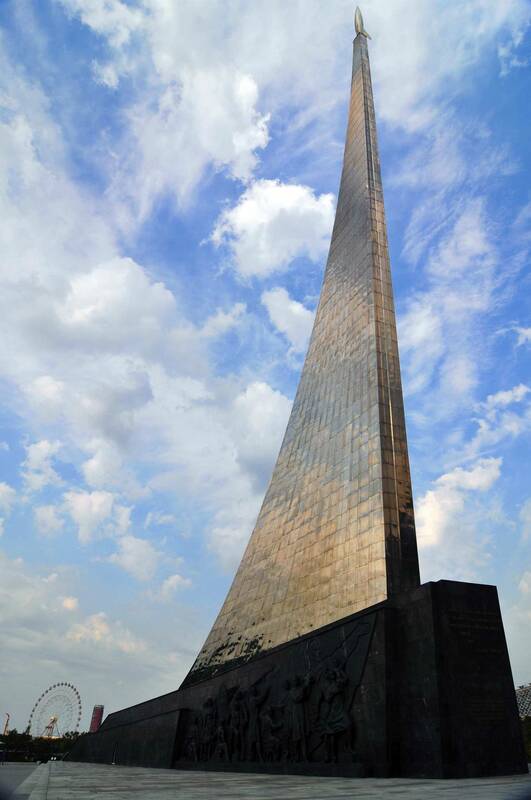 The Monument "To the Conquerors of Space" was erected in Moscow in 1964 to celebrate achievements of the Soviet people in space exploration. The Memorial Museum of Cosmonautics is located inside the base of the monument. The monument is located outside of the main entry to today's All-Russia Exhibition Centre (known until 1992 as the Exhibition of Achievements of the National Economy, VDNKh), in the northeastern part of Moscow, near Prospekt Mira ("Peace Avenue"). The easiest access is from the VDNKh subway station. 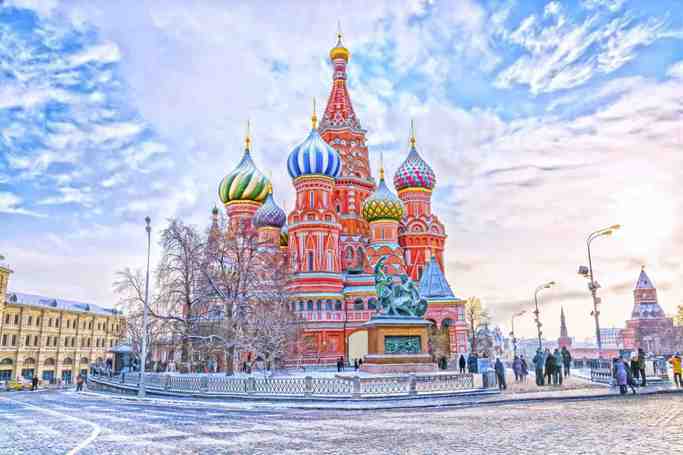 Since the 1960s, this part of Moscow in general has had a high concentration of space-themed sights and names: besides the monument and the museum under it, the grand "Cosmos" pavilion in the Exhibition Centre displayed many artifacts of the Soviet space program. Many streets in the area have been named after the precursors of the space program (Nikolai Kibalchich, Friedrich Zander, Yuri Kondratyuk) and its participants (Sergey Korolyov). The choice of this part of Moscow for space-related names and monuments may have been inspired by the fact that Prospekt Mira runs toward the north-eastern suburbs of Moscow, where, in Podlipki (today's Korolyov City) much of the space program was based. Korolyov himself lived in a house within a few blocks from the monument, which is now preserved as Korolyov Memorial Museum. Both sides of the monument base, in their front parts, are decorated with haut- and bas-reliefs depicting men and women of the space program: scientists, engineers, workers, their occupations indicated by appropriate accoutrements of the professions. Notable figures include a computer programmer (or perhaps some other computing or telecommunications professional) holding a punched tape, a cosmonaut wearing a space suit, and Laika, the first space dog. No contemporary Soviet politicians are depicted in the monument either (that would violate the convention existing in post-Stalin's Soviet Union against commemorating living persons in this fashion), but the crowd on the right side of the monument are moving forward under the banner of Lenin. 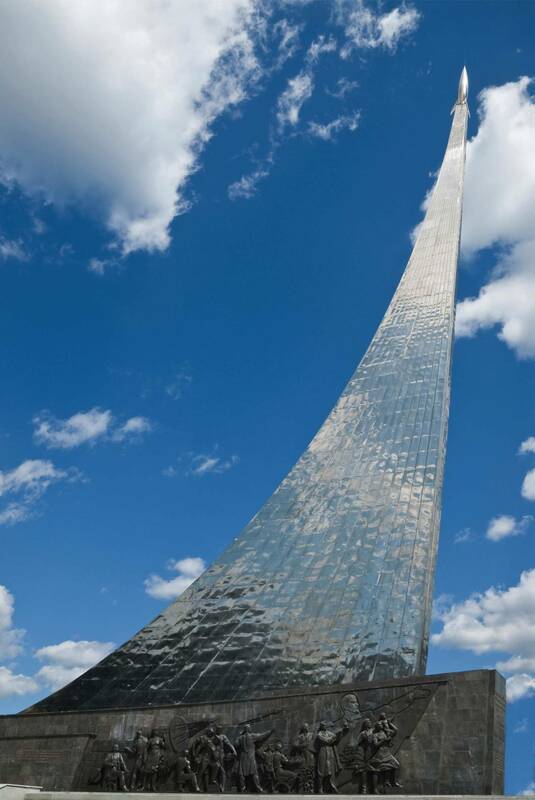 Monument to the Conquerors of Space | eTips Inc.